With support from the Gaelic Language Act Implementation Fund (GLAIF), Newbattle has been celebrating and promoting Gaelic language and culture for several years. See below for more details about what we have been doing. Gill Turner is a consultant at Newbattle Abbey College. Our contract with Gill is that she develop the College’s Gaelic language and cultural programmes. Gill is a Gaelic learner. The classes are designed to help you learn conversational Gaelic for use in everyday situations. Improvers level – The courses are suitable for those who have done a beginners Gaelic course and who would like to build on that. You will extend your vocabulary, learn new verbs, (past and future tense), learn times and dates and do some basic conversation. Learning methods will include: help with pronunciation, language games, short conversations, a little grammar and some reading and writing. The classes will run for 8 weeks finishing on the 13 June 2019. The classes are suitable for adult learners. To book a place on the course in either location, please contact Jackie Kane on jackiekane@newbattleabbeycollege.ac.uk, or phone 0131 663 1921. Both courses were developed in partnership with Sabhal Mòr Ostaig. Gaelic language and culture feature prominently in this course. It commenced in September 2014. See website for more information. For children and parents in Gaelic medium education. Come and experience a weekend packed full of activities to improve and develop your Gaelic. Free accommodation available for overnight stay (£30 booking fee applies). 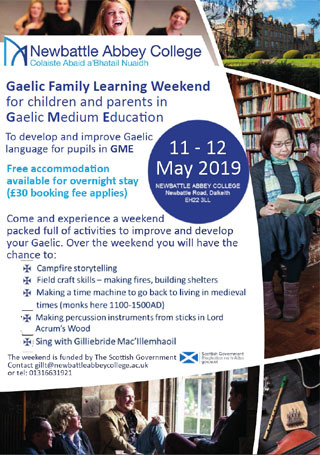 Come and experience a weekend packed full of activities to improve your Gaelic. Click on the poster to view the details.